Homemade plum jam is a summer treat to make then enjoy throughout the year. 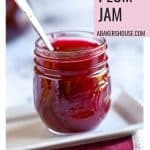 I’ve gotten back into canning mode around here and this plum jam recipe was a delicious way to preserve summer’s fresh fruit. Plums can be overlooked as a jam flavor option. 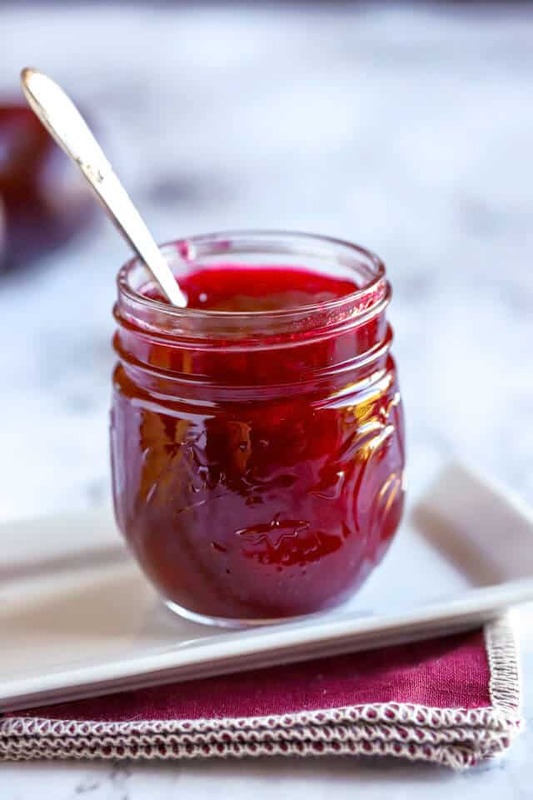 In the grocery store you’ll find strawberry jam, grape jelly, orange-lemon marmalade and maybe something a little off the beaten path like apricot jam. But plums? Not usually an option. Therefore it is best to make your plum jam at home. Once you try it you’ll want to repeat it each year when plums are in season. The recipe for plum jam is simple and comes from a beautiful book produced by Williams-Sonoma called The Art of Preserving. The photos are gorgeous and many of the jams and jellies are accompanied by recipe ideas which is a very useful effort on the part of the book’s authors, Rick Field, Lisa Atwood, and Rebecca Courchesne. If you are looking for plum jelly, the differences are minimal. The main difference between jam and jelly is that jam usually starts with fresh (or frozen) fruit while jelly begins with fruit juice. 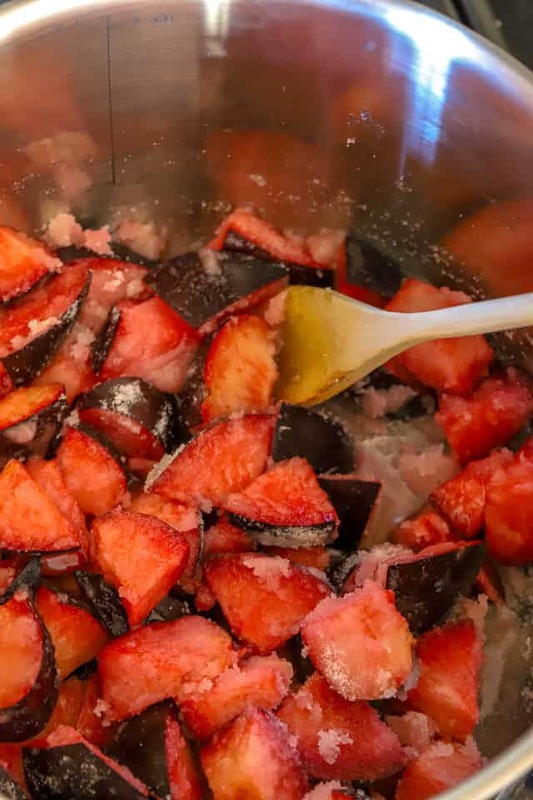 If you cook the fruit down in this recipe to nearly a puree and do not leave any chunky bits, it will taste like plum jelly even though we’ve started with fresh plums. Plums are an ideal fruit for making jams because the skin is left on the fruit. You can skip the fussy step of removing the skin; it, in fact, holds a lot of the pectin in the fruit which helps the jam to gel. You might ask, What is pectin? Pectin is a substance found naturally in some fruits that when heated with sugar, it helps a jam thicken. Some fruits are high in pectin and others are not. Therefore, some canning recipes call for adding pectin. 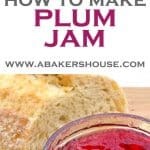 For this plum jam recipe, no additional pectin is needed. 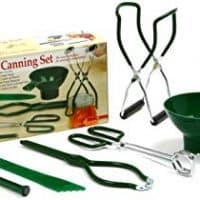 Set yourself up for canning success by having the basic canning supplies. 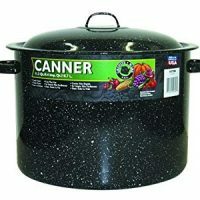 Read more about canning supplies in this post. The basics for making jam: Wash and cut the plums in half. Remove the pits. Cut the plums into chunks. What a stunning color! Next, add the sugar to your plum slices. This looks like a lot of sugar because, well, it IS a lot of sugar. One of the few pitfalls of making jam at home is that you can no longer pretend that a bit of jam on top of your whole wheat bread each morning might be healthy. Nope, you now possess the knowledge that you dredged your fresh fruit in a sugar bath. But that is ok, the result is delicious. Just go with it. Put the plum and sugar mixture into a large saucepan and add the lemon juice and water. 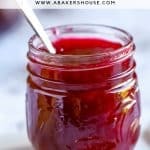 The recipe stated fresh lemon juice but I recall learning along the way that bottled lemon juice has a more consistent pH level and it is best to use bottled when canning so that is what I did with this plum jam. Cook your fruit and sugar mixture, bringing the jam to a full rolling boil then stirring for 15-20 minutes. (The recipe called for 10 minutes but my jam was not to the right stage at that point. It may be due to my altitude in Denver.) This recipe doesn’t require any additional fruit pectin. 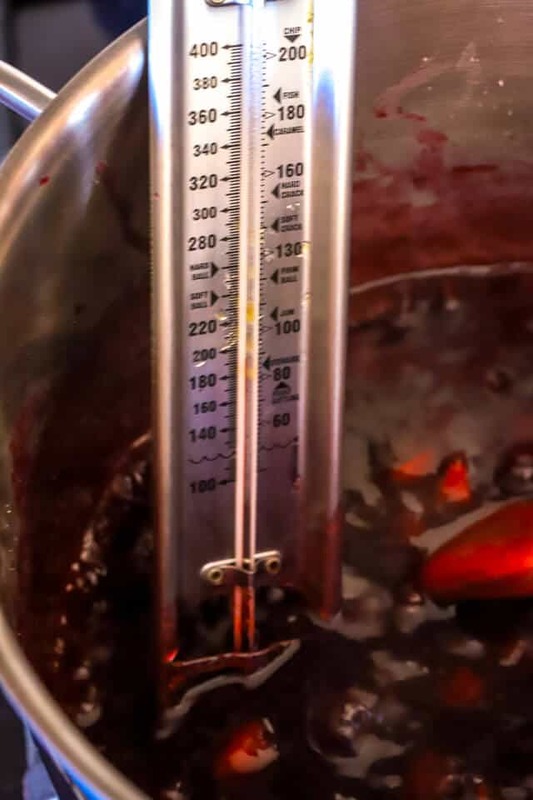 Use a canning thermometer to make sure that your plum jam has reached its gelling point, then remove it from the heat, ladled it into the prepared jars and continued with the canning process if desired. Follow the usual procedure for canning when using a water bath canner: prepare and sterilize your jars and lids. Process the jars according to your altitude. It takes a lot of time to bring a large pot of water to the boiling point. 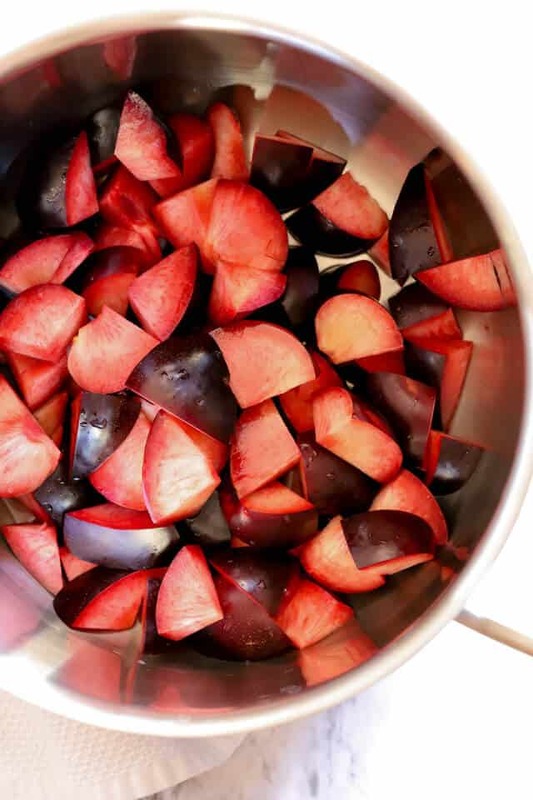 Plan ahead and get your boiling water-bath started before you heat up the plum mixture. You want to time things such that your water-bath is ready when you have filled the jars. Process the jam then let the jars cool completely before moving them. They will be hot! Is Plum Jam the same thing as Plum Jelly? By definition jam is made from fresh (or frozen) fruit while jelly is made starting with fruit juice. 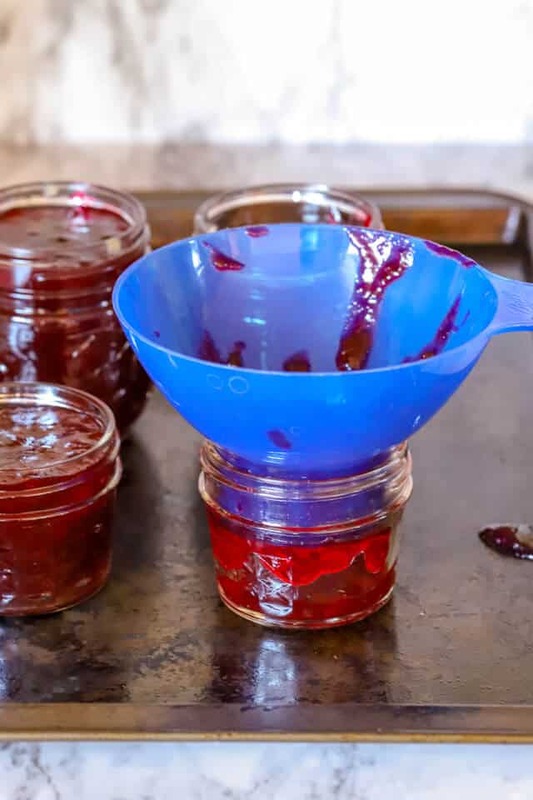 Often jelly recipes will have a step in which the mixture is strained through a cheesecloth so that the resulting jelly is smooth and free of any small bits of fruit. I think making plum jam and plum jelly would be quite similar. 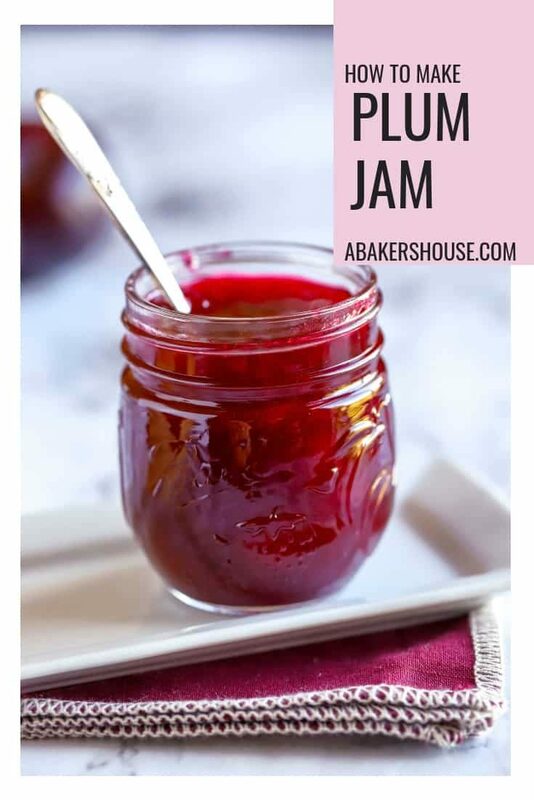 The jam is very smooth and free of chunks of plums even though there is not a need to use a blender or hand-held immersion blender to puree the mixture. 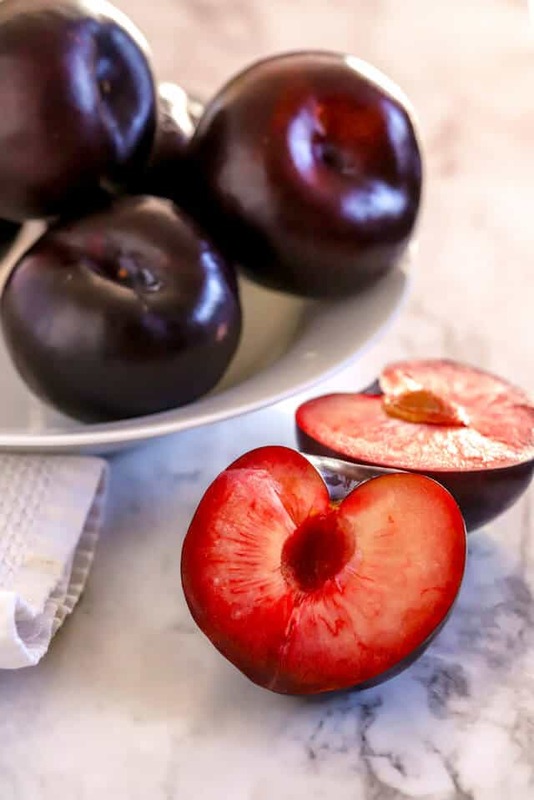 Plums break down naturally and very easily in the cooking process which creates a uniform result. The same holds true for grapes. Here is a recipe that makes homemade grape jelly. Plum jam is recommended to be used as a topping for vanilla ice cream or as a complement to pork. I plan to try both. And you can’t go wrong slathering plum jam on a fresh piece of homemade bread, of course! Try plum jam in the middle of these jam sandwich cookies. What is freezer plum jam? 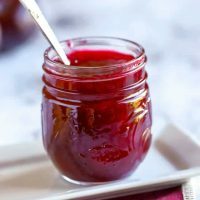 This isn’t a recipe for freezer plum jam but I am interested in trying that technique. Freezer jam isn’t simply homemade jam that you store in the freezer, as I once thought. Instead making freezer jam refers to the process where you do not cook the fruit. 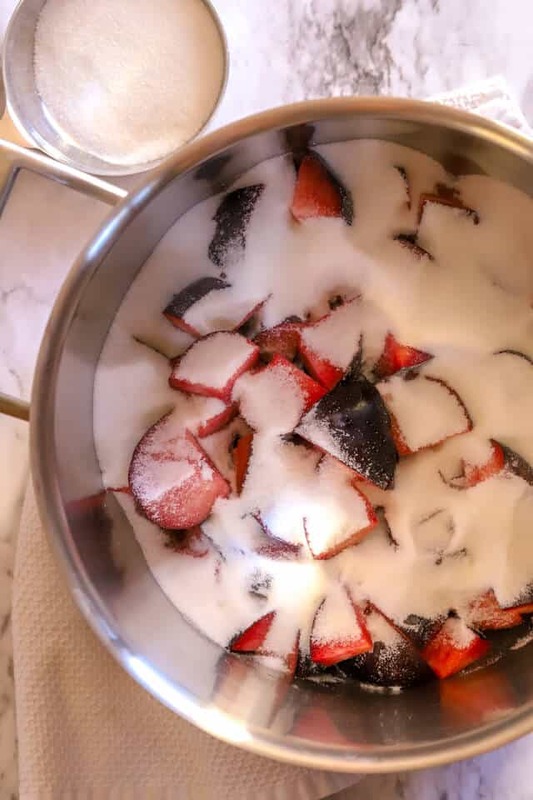 Instead, you combine fruit with sugar at room temperature, let it sit (similar to macerating berries) then you add pectin that has been heated with water. You can store freezer jam in the refrigerator or the freezer. Wash and cut the plums into chunks, removing the pits. Combine the plums, water, lemon juice and sugar in a large saucepan. Bring to a boil to dissolve the sugar, stirring continuously. Continue to stir for 15-20 minutes, or until the gelling point has been reached. Remove from the heat and ladle into glass mason jars. Proceed with the boiling water canning method, if desired. If not, store the plum jam in the refrigerator. I processed this jam for 15 minutes (altitude in Denver requires a longer processing time) but in many locations 10 minutes would be the standard. This nutrition data was provided by Nutrionix and is to be an estimate only. Please note that this post was originally published in August, 2012, and was updated in September, 2018.
i bet that tastes so yummy! Every time I make jam I cringe when I dump that truck load of sugar in the pan. 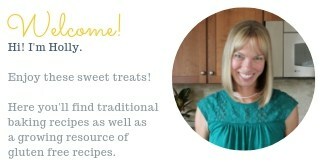 I then transport myself to that land of denial that I live in and convince myself that it is homemade and healthy. Hey, a girl can dream. Since I’ve still got some empty jars sitting around I think I’ll go buy some plums. This sounds like a really nice change to all that “healthy” cherry jam we have been eating. This looks so good and I also think you should put up the recipe for that bread. 😉 There isn’t a better combo in the world that homemade jam AND bread! 🙂 New follower here. Yay for being blog friends! That looks so delish – great images. We too had a bumper crop of plums. Popped by from Shabby’s linkup. So nice to meet you and thanks for leaving a comment. It’s always fun to meet someone who has read something I’ve posted. I’ll be sure to stop by your blog too. I like the name of it already! Hi, thanks for your comment! I’ll have to try making this with different varieties of plums to see how the color changes. Yes, mine is lighter than I thought it would be, too, and it looks closer to the color of the grape jelly on my shelf. Thanks for stopping by! I love this, but I have to admit it really brought back memories for me. My Mama used to make plum jelly. It had the most beautiful color, and your jam does too. Great recipe! Isn’t it special how food brings back memories? Wonderful, hope you enjoy it! 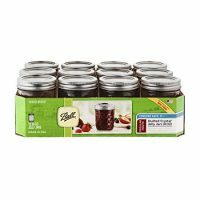 I had no idea making your own jam was so easy! This sounds delicious! Thanks! Yes, making jam is simple and worth the time commitment. I love plums! While I usually just eat them by themselves, I think this is on my bucket list now. Great idea making jam out of them. 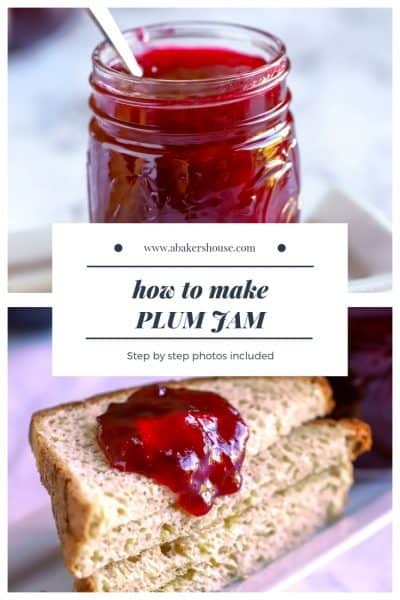 You probably have the right idea simply eating plums plain– jam certainly adds a lot of sugar but gosh, does it taste good! Plum is such a wonderful late summer flavor, I love the idea of capturing it to last a little longer! As amazing as this would be by itself or with any type of bread or dessert, I’m also imagining it paired with all sorts of savory dishes like pork chops! So versatile and delicious!